It is a country where history blends with modern life, the sun-kissed islands are blessed with splendid beaches and the sea flows into the breathtaking sunset. All this is part of the unexpected thrills that greet the visitor who may not be familiar with the ancient charm of Greece. Athens’ Mykonos is one of the most popular and scenic islands with many famous beaches. Almost all the houses there have been whitewashed and turned into small traditional hotels. It is a small island but moving around is difficult as there is a scarcity of public transport. The island is well known in Greek mythology. Meanwhile, Little Venice in the old town where the houses were almost in the water, which make it looks like the Italian city. Santorini, the name indicates the speed of this ferry was so fast that the passengers were not allowed to even stroll outside in the deck. Santorini is one of the Cyclades islands on the Aegean Sea, which had its last volcanic eruption in the 16th century. 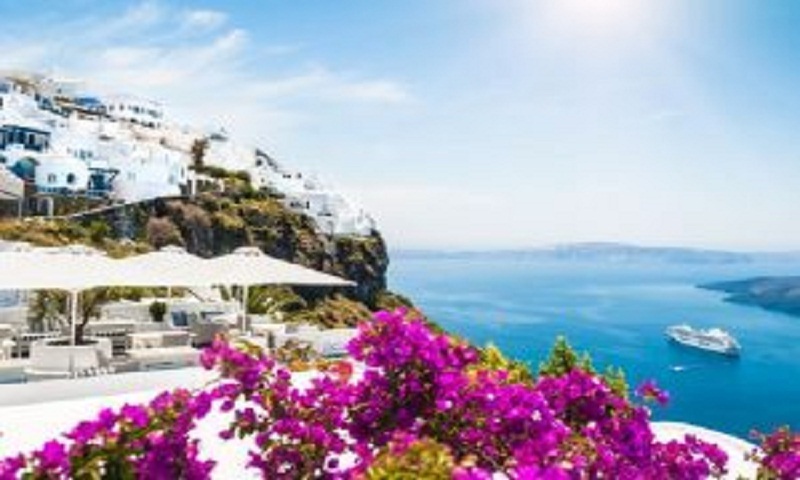 The island of Santorini is picturesque, with volcanic mountains on one side and the sea beside it. Because of the great Mediterranean weather grapes are grown in abundance throughout Greece and most of the fine wineries are located in this belt. Thirassiawe, the world’s most iconic sunset. Kamari beach which is a black sand beach. It has plenty of eateries, shops and travel agencies around. Walking barefoot on the beach is not at all pleasant as these black sands are the granules of the volcanic ashes, which hurt one’s feet. Mycenae the golden city of King Agamemnon who united all of Greece to fight against Troy. It is a large site and includs a long walk. The town of Nafplion, which is the old capital of Greece. This beautiful town has neo-classical well-preserved mansions contrasting with the latest stores as well as local shops selling handmade items and jewellery. There have gorgeous countryside and landscape of Greece. Meadows and hills, topped with small cottages all bearing the same colour (tan red), tall alpine trees piercing the clear blue sky. It is like travelling in the land of fairy tales and passing through the village of Cinderella. The quaint little town of Olympia. The ancient ruins date back more than 2,000 years when the first ancient Olympic Games took place. A temple of Zeus and Hera was constructed to honour the gods before the beginning of the game. Meteora, which is a fivehour journey from Olympia. The roads are hilly. Meteora means “suspended in the air”. There are three monasteries located neatly on the top of the hill. Delphi, which is about three hours’ drive from Meteora. The archaeological site of Delphi was the best of all the ruins in Greece. There are two sanctuaries — Apollo and Athena. According to Greek mythology, the place is the centre of the earth and the centre of wisdom and spirituality. The little town is located on the hills, not far from the ancient ruins. Athens, the historical city is by taking a hop-onhop-off bus (available in different colours — red, blue and yellow). These buses provided onboard audio guide, which described the history and significance of the places. The Acropolis includes the main temple of Parthenon. One of the most pleasant experiences is the hospitality in Athens. Greece has countless sites of immense beauty that would find place in a list of “what to see in a lifetime”. Bermuda - the beautiful island! Air India demands crew "Jai Hind"